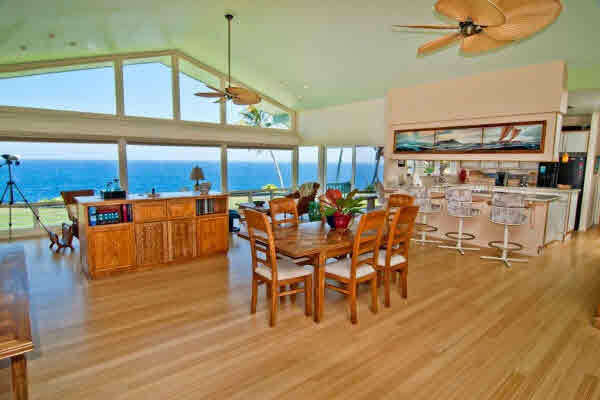 This is Hamakua Coast oceanfront at its finest (MLS# 245061). The meandering driveway leads to this secluded home at the ocean’s edge with 260 feet of sea cliff. 1.7 acres surround the property, creating a tranquil oasis that takes you away from the hustle and bustle of modern day life in Hawaii. This property is tucked away in Hakalau, yet conveniently located just 15 minutes North of downtown Hilo, and only a walk to Historical Hakalau Beach Park. Not only is this beach park one of the few in East Hawaii for surfing, body boarding, swimming, and fishing, the battered remains of the enormous Hakalau Sugar Mill and Wharf are present, offering a glimpse of the area’s awesome history. The main house includes two large bedroom suites each with a full bathroom, large open vaulted living area, and modern kitchen—all with stunning wide open views. Being sold “turn key” includes all household furnishings, plus a 2010 Titan king cab truck with just 20,000 miles and still under full warranty. Two Herb Kane serigraphs—valued at $6,000 and $4,000 each—also included. Sale includes all furnishings and a bonus 2010 Titan king cab truck! Contact listing agent and Hamakua specialist, Beverly Molfino, R(S), with Elite Pacific Properties for more information about the terms of auction sale.